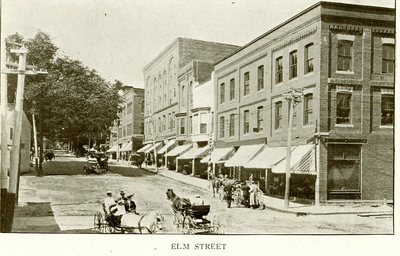 "Camden, Maine Elm Street Postcard "
A postcard of Elm Street in Camden, Maine. The image appears within in a booklet of souvenir images of Camden. The phrase, "Follansbee & Wood, Dry Goods, Camden, Maine" appears on the front of the booklet. Produced by the Douglas Publishing Company in Buffalo, New York, circa 1900.